Smith Holt Helmet is a very good value for the money. If you are looking for a helmet that is suitable and reliable for almost any purpose, Smith Holt Helmet makes an excellent choice. Smith Holt Helmet is actually designed as a winter sports helmet, but, thanks to the excellent venting and convertible pad kit, you can also use it as a bike helmet in the warmer months. So, you don’t need to buy multiple helmets for skiing, snowboarding, and biking – all you need is just Smith Holt Helmet. Despite the simple yet fashionable design, Smith Holt Helmet is surprisingly very rugged. It can take all the beatings you can expect to happen on a sports helmet, and it does not budge. It protects the head very well. Smith Holt Helmet may appear pretty plain and simple. As a sports helmet for skiing and snowboarding, the helmet simply protects the top and back of the head. It does not cover the face. The shell is made using the Bombshell / ABS plastic construction. The shell is highly sturdy, rugged, and durable. Unfortunately, the outer surface has a matte finish. The advantages of a matte finish are that it looks elegant and it does not reflect light. However, a matte finish is very prone to scratches. If you accidentally drop it, chances are it will no longer look new. You should be careful when handling it. On the left and right sides of the helmet, there are thick pads that protect your head from sideways impacts. These pads are soft and comfortable, but can be improved to allow more breathability. The venting on the top of the helmet is excellent, though. Smith Holt Helmet is equipped with the AirEvac venting system, featuring 14 vents that generate great airflow to remove heat and fog-causing air. So, the top of your head can stay cool and fresh, and your goggles clear. Smith Holt Helmet is available in various color choices. The color variants are nice and trendy. There are black, white, gunmetal, charcoal, green kelly, mint, solar, red sriracha, and pink fuchsia color options. Smith Holt Helmet is equipped with the self-adjusting Lifestyle Fit. You simply need to pull and wear the buckle closure, and the helmet will automatically fit on your head. It is simple and easy to use, and the fit is snug, secure, yet comfortable. Another nice feature of Smith Holt Helmet is that the design of the helmet allows you to wear a headset. Actually, Smith Holt Helmet claims to be compatible with the Skullcandy audio products, but it is also usable with pretty much any other pair of earphones. 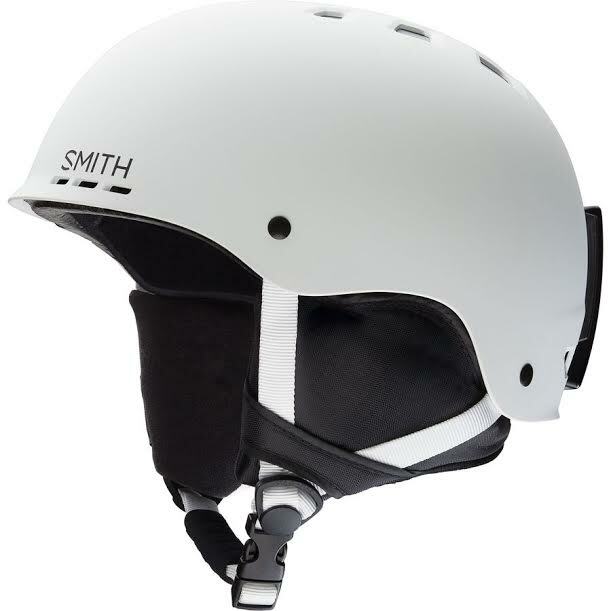 Even though it is a winter sports helmet, Smith Holt Helmet comes with a convertible pad kit that enables you to customize the helmet for the summer. Hence, you can also use Smith Holt Helmet for summer skateboarding and bicycling! Check the best price of Smith Holt Helmet here!